To calculate %slope of the land from contour maps, one still needs to determine the rise and run. On a map, the rise is the difference in elevation between two points. The run is the horizontal distance between two points. Map distance is always horizontal distance. The rise is the difference in elevation between two points. Using the elevations printed on the map and the contour line interval, an elevation can be determined for the top and bottom of the slope in question. It generally works better to simply determine the elevation at each point and subtract rather than count the contour lines between two points. Doing the latter often results in rounding errors or double counting a contour line, which can throw slope readings off by 10 percent or more. To determine the run, the map distance is measured between the two points and converted to the same units as the elevation. If difference in elevation is measured in feet, distance should also be calculated in feet. If difference in elevation is measured in meters, distance should also be calculated in meters. An excerpt from a contour map is shown below. To determine the %slope from Point A to Point B, the rise and run must first be determined. The map distanced measured 1.8 inches with an engineer’s scale. 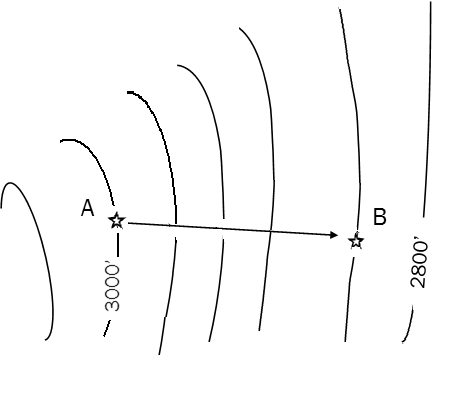 From Point A to Point B, the slope is –18% (downhill); from B to A the slope is +18% (uphill).